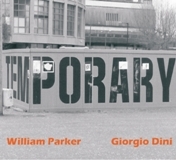 SR0903 - WILLIAM PARKER & GIORGIO DINI: "TEMPORARY"
Five duets of freely improvised music, dialogue and creation of highly expressive musical movements, always changing. The basses merge, counterpoint, whisper, scream, conversate in a revelation of expression and the broad sound range that they are able to produce. A conquering listening experience. "Improvisation is the organizing of sound without relying on preset music notation, spontaneously playing music without any preset thought, responding to sound intuitively, second to second." William Parker, from the book "who owns music", edited by buddy's knife edition.